The Principality of Andorra ( Catalan: Principat d'Andorra, French: Principauté d'Andorre, Spanish: Principado de Andorra) is a small landlocked principality in southwestern Europe, located in the eastern Pyrenees mountains and bordered by France and Spain. Once isolated, it is currently a prosperous country mainly because of tourism and its status as a tax haven. It has the highest life expectancy in the world, at 83.51 years. Andorra has no military force of its own; its defence is the responsibility of Spain and France. The name "Andorra" is of unknown origin but (according to Joan Coromines) clearly pre-Roman. Many of the local toponyms are of Iberian- Basque origin. Tradition holds that Charlemagne granted a charter to the Andorran people in return for their fighting the Moors. 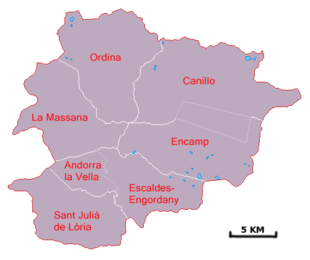 Overlordship of the territory passed to the local count of Urgell and eventually to the bishop of the diocese of Urgell. In the 11th century a dispute arose between the bishop and his northern French neighbour over Andorra. In 1278, the conflict was resolved by the signing of a paréage, which provided that Andorra's sovereignty be shared between the French count of Foix (whose title would ultimately transfer to the French head of state) and the bishop of La Seu d'Urgell, in Catalonia, Spain. This gave the small principality its territory and political form. In 1933 France occupied Andorra as a result of social unrest before elections. On July 12, 1934, an adventurer named Boris Skossyreff issued a proclamation in Urgel, declaring himself Boris I, sovereign prince of Andorra, simultaneously declaring war on the bishop of Urgel. He was arrested by Spanish authorities on July 20 and ultimately expelled from Spain. From 1936 to 1940, a French detachment was garrisoned in Andorra to prevent influences of the Spanish Civil War and Franco's Spain. Francoist troops reached the Andorran border in the later stages of the war. Given its relative isolation, Andorra has existed outside the mainstream of European history, with few ties to countries other than France and Spain. In recent times, however, its thriving tourist industry along with developments in transportation and communications have removed the country from its isolation and its political system was thoroughly modernised in 1993, the year in which it finally became a member of the United Nations. Andorra is a principality with the President of France and the Bishop of Urgell, Spain as co-princes. Politics of Andorra takes place in a framework of a parliamentary representative democracy, whereby the Prime Minister of Andorra is the head of government, and of a pluriform multi-party system. Executive power is exercised by the government. Legislative power is vested in both the government and parliament. The Judiciary is independent of the executive and the legislature. A secessionist movement exists, based at Pas de la Casa. This has only limited support. Administrative subdivision of the Principality. Befitting its location in the eastern Pyrenees mountain range, Andorra consists predominantly of rugged mountains of an average height of 1996 meters with the highest being the Coma Pedrosa at 2946 meters. These are dissected by three narrow valleys in a Y shape that combine into one as the main stream, the Valira river, leaves the country for Spain (at Andorra's lowest point of 870 m). Andorra's climate is similar to its neighbors' temperate climates, but its higher altitude means there is on average more snow in winter and it is slightly cooler in summer. The banking sector, with its tax haven status, also contributes substantially to the economy. Agricultural production is limited—only 2% of the land is arable—and most food has to be imported. The principal livestock activity is domestic sheep raising. Manufacturing output consists mainly of cigarettes, cigars, and furniture. Andorra is not a full member of the European Union, but enjoys a special relationship with it, such as being treated as an EU member for trade in manufactured goods (no tariffs) and as a non-EU member for agricultural products. 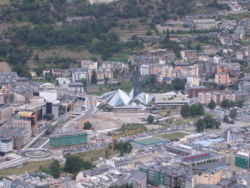 Andorra lacks a currency of its own and uses that of its two surrounding nations. Prior to 1999 these were the French franc and the Spanish peseta, which have since been replaced by a single currency, the euro. Unlike other small European states that use the euro, Andorra does not yet mint its own euro coins; in October 2004, negotiations between Andorra and the EU began on an agreement which would allow Andorra to mint its own coins. Andorra’s natural resources include hydropower, mineral water, timber, iron ore, and lead. Andorrans constitute a minority in their own country; only 33% of inhabitants hold Andorran nationality. The largest group of foreign nationals is that of Spaniards (43%), with Portuguese (11%) and French (7%) nationals the other main groups. The remaining 6% belong to several other nationalities. The Current population is estimated at 71,201 (July 2006). The only official language is Catalan, the language of the nearby Spanish autonomous region of Catalonia, with which Andorra shares many cultural traits, though Spanish, Portuguese and French are also commonly spoken. The predominant religion is Catholicism. Andorra's long history has provided it with a rich folklore and an abundance of folk tales, with roots originating as far as Andalusia in the south and the Netherlands in the north. 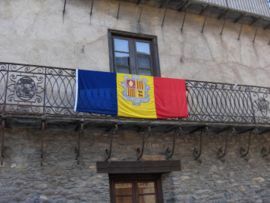 Andorran culture is Catalan in essence, since the native-born population of Andorra is Catalan. However, it has given a significant and easily identifiable contribution to the conglomerate of Catalan culture. Two writers renowned in Catalonia and the region, Michèle Gazier and Ramon Villeró, both come from Andorra.